Just awesome Features by Google. 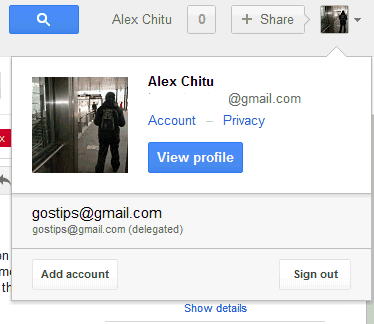 Thank you so much now i can handle my 4 Gmail account within a single Interface. Is it possible to handle more than two act from one interface? I was going to send you this! I like this look better. What I don't like is that there's no "Sign out of all account" like before option. There technically is. "Sign Out" signs out of all accounts. I don't believe there was ever a way to sign out of just one account without it signing out of all of them. No there was a "Sign out of all accounts link" which I used to do that, but I don't remember if I signed out of one account, it kept me signed in to the others. Both "Sign out" and "Sign out of all accounts" always signed out of all of them. One of the greatest ideas from Google in the recent times. We need this on blogger, I'm tired of being chained to my default account on blogger. Also, add notifications for all google services including calendar, reader, blogger, youtube, etc to notifications area. What users liked about Google and one of the reason why Google become a hit among internet users was its simplicity and cleanliness. It is good to read that Google is keeping things as simple as possible, as this is the real beauty of Google. Simple but efficient!!! Simplicity is good. I'm not sure if this is related, but I run gmail in a chrome app (standalone) window and since the "change," switching accounts opens the "switch to" account in a second, normal browser window rather than switching to the alternate account in the same window. Unfortunately, that's kind of annoying and very inefficient. It does the same to me in Safari. Not a total fail, but I did get used to switching between accounts in the same window.